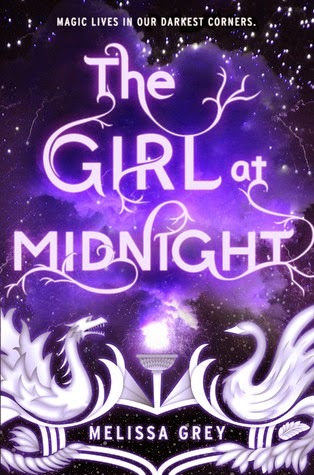 Read my review of The Girl at Midnight! MELISSA GREY was born and raised in New York City. She wrote her first short story at the age of twelve and hasn't stopped writing since. After earning a degree in fine arts at Yale University, she traveled the world, then returned to New York City where she currently works as a freelance journalist. To learn more about Melissa visit melissa-grey.com and follow @meligrey on Twitter. Hmm, that's a hard one. I like synesthesia maybe. This is tough! I would probably go with 'Kerfuffle' meaning a fuss because I think the word is cute hah. Thanks for the giveaway! I cannot wait till my preorder gets here!! AAAAAAAAAAAAAAAAAAHHHH!! I have always loved hippomonstrosesquippedaliophobia which means the fear of long words. Strikhedonia; the pleasure of being able to say to hell with it! Ruffian. It, without fail, makes me laugh every time. Callipygian because it means "having shapely buttocks", and I think that it's hilarious that there's a word for that, ha. My favorite word is codswallop, meaning nonsense! I like to shout it out loud when I'm arguing with someone, even if what they're saying makes sense ;)! My favorite odd word is gadzooks, it's a G rated oath. I guess I don't have any odd words, because I can't come up with one, but I'm going to look some up now. Sounds like fun!